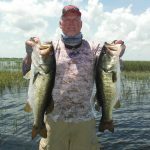 This week on Lake Okeechobee the winds have been light if any at all and the water temp is 87-91 degrees. The water clarity is good all around the lake. I have been fishing the south end of the lake this week and the best bait has been a 1/2 oz. spinnerbait in a white or shad color. A white swim jig has been a close 2nd choice in the morning. This is good up to 08:00 then I have been flipping / pitching a Black/Blue jig in 1oz. the rest of the day. The water has come up some and the fish are spread out some, just keep your head down and cover water. Most of my fish are on the outside grass line but do not over look the inside. Here is a picture of a couple of fish I caught this week.